Mark and I are excited for our first Christmas Inn tour here in Lanesboro. Set for the first Sunday of December, the tour will feature beautiful homes, seasonal decorations and holiday treats and entertainment. The Habberstad House at Christmas. 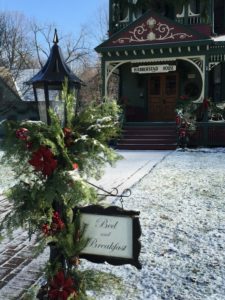 Seven participating inns will be decorated for the holidays as Lanesboro area innkeepers welcome you to visit at this special time of year. Set for December 4 from 2 to 6 p.m., the tour will feature beautiful homes, seasonal decorations and holiday treats and entertainment. Tickets for the tour are available through the Lanesboro Chamber of Commerce or 507-467-2696. Tickets are $20 in advance or $25 the day of the tour. Those staying at participating inns will receive half-price admission to the tour. Many Lanesboro downtown businesses and restaurants will be open the day of the tour for holiday shopping and enjoyment.